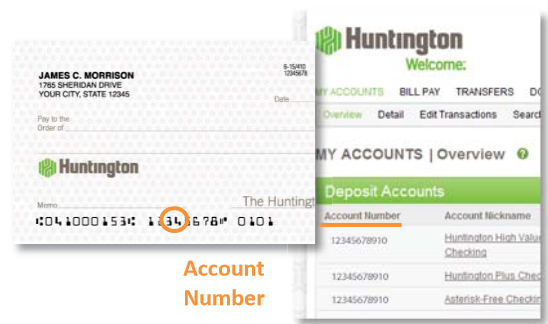 Huntington Bank Routing Number is a 9 digit number required for various bank transactions such as electronic wire transfers, direct deposits, ACH transfers, check reordering etc. It is also referred to as routing transit number, aba routing numbers and ACH routing number. Huntington Bank Routing Number for Wire Transfer is 044000024. Huntington National Bank's swift code is HUNTUS33, which may be needed for international wire transfers. 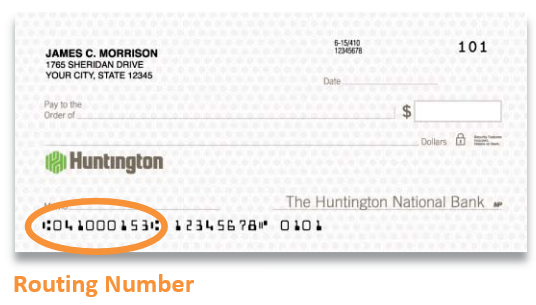 There are two ways to find your Huntington Routing Number. All you need is your Huntington bank account number in Online Banking or on check book. The chart below will enable you to use the third and fourth numbers of your account number to find your routing number.